The University of Alabama has sued Daniel Moore, an artist who paints pictures of various sporting events. Among his work is a picture entitled "The Sack," depicting a play in a 1986 college football game where Cornelius Bennett of the University of Alabama sacked Notre Dame's Steve Beuerlein. The university claims that Mr. Moore is infringing the its trademark rights, including its "famous crimson and white color scheme." This theory of infringement comes from a recent case where the University of Oklahoma, The Ohio State University, The University of Southern California, and Louisiana State University successfully sued a company making T-shirts using their schools' colors, although not identifying the schools directly. The schools recently won judgment of infringement (the court's order is available here). This is not the first time an artist has been sued in a similar situation. In 2003, the Sixth Circuit Court of Appeal heard a case where an artist painted images of six past Master's golf tournament winners. 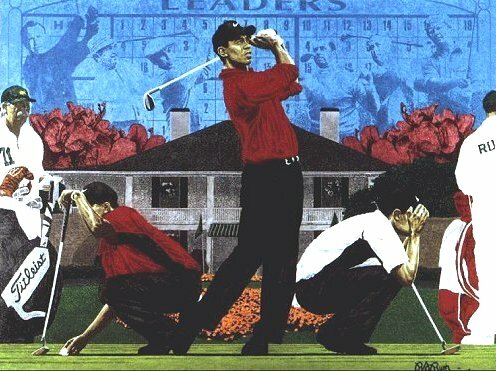 Tiger Woods, who was prominently featured in the picture, sued, claiming the painting infringed his right of publicity. The court found for the artist, finding his work protected by the First Amendment. It will be interesting to see how the court reconciles these two authorities as the case progresses.